For the multitalented Lin Dihuan, life is not fully lived if you do only one thing or have just one career. Liu Xiangrui reports. Though not a professional artist, Lin Dihuan is wildly popular as a painter, thanks to his works such as a series of ink-and-brush paintings dedicated to the Chinese 24 Solar Terms as well as two series of stage settings tailored-made for the phenomenal TV show Rendezvous With Chinese Poetry. The 43-year-old Zhanjiang native teaches communication and design at Sun Yat-sen University in Guangzhou, capital of Guangdong province. Lin, a Guangdong native, became a celebrity after his 24 Solar Terms work was chosen as the illustration for the UNESCO heritage listing application. His illustrations play an important role in getting the 24 Solar Terms - a treasure trove of knowledge developed through years of observing the sun's annual movements - added to UNESCO's List of Intangible Cultural Heritage in November 2016. According to Lin, he spent nearly three months combining traditional Chinese elements with more contemporary aesthetics to produce the 24 Solar Terms series, which were originally created for his book on photography in 2012. The paintings were based on his observations of rural life, which is closely connected with the solar terms. And he used circular compositions with minimal strokes to depict each solar term's typical traits. "I had no idea back then that my work would be a part of a UNESCO Intangible Cultural Heritage application," he says. Later, Lin's popularity soared even more when he was invited to do stage backdrops for Rendezvous With Chinese Poetry, broadcast on China Central Television. The 10 works, based on lines from 10 ancient poems, wowed many with their impressive illustrations of the poems' content and the painting techniques. He was asked again last year to paint stage backdrops for the program's latest season. Lin says his painting is based on traditional calligraphy, on which he spends more than 10 hours a week. "Unlike many professional artists, I am not too focused on techniques when I paint. I try to look at a painting with an outsider's perspective, and often bear in my mind questions like what the painting can bring to me, to others, and to the world," he says. According to Lin, his style changes according to the themes, but the principle is that he has sympathy and a soft heart when painting, and tries to deliver that feeling to viewers. Lin, who grew up in a rural family in the coastal city Zhanjiang, has loved calligraphy and painting since he was a child. When he was little, the family was too poor to afford regular art education, so he taught himself. He used to spend his pocket money to buy books and magazines from recycling centers, and copy the paintings from them. To cut costs, he learned to use a minimum palate and the simplest materials. Lin started doing caricatures for magazines when he was in middle school. And later, Lin followed his father's suggestion and studied clinical medicine in college. However, instead of becoming a doctor like his classmates, Lin started doing administrative work at the university. He says he made the decision because he felt he was too "unrestrained and vigorous" to be a doctor. Since then, Lin has made full use of his free time to pursue his hobbies and "do anything I find interesting". He became one of the first-generation web designers in China in the 1990s. And thanks to that, he was later transferred to the university's internet center, before eventually taking on his current position. Speaking about how his career has progressed, Lin says he does not regret doing jobs not connected with his college major. "A man has only one life, and it is not fully lived if you do only one thing or have only one career," he says. "I dream of being a person who cannot be defined with a simple title." In keeping with his creed Lin took up photography in 2007. According to him, he initially started taking pictures only to collect material for painting. 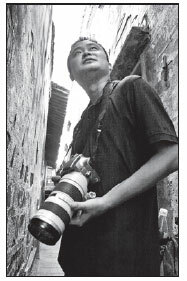 He has traveled to more than 200 Chinese cities and taken more than 600,000 photos in the past few years. He is now a member of the National Photographers Association, and was recognized in 2012 as one of the most influential photographers of the year by the newspaper China Photography. So far, he has published several books on photography, including his best-seller, Waiting for A Blossom. And he continues to record the lives of ordinary Chinese with his lens, and shoot photos about daily life in small cities and rural areas. In the course of his work, he pays a lot of attention to "left-behind" children and seniors in China's rural areas. Speaking about the children, he says he remembers being shocked while photographing a 5-year-old girl in Weining, Guizhou province, during a trip there in 2016 as the girl was suffering from malnutrition and was poorly clothed in winter. So he made up his mind to do something for those children. In the past couple of years, Lin has raised nearly 1 million yuan ($156,000) through sales of his paintings to fund the educations of the "left-behind" children in a remote rural school in Weining. He also organized several trips to send aid there, including clothes, books, stationery and snacks. During his most recent visit to the area, Lin took along painting materials for the children. Zhou Lu, one of Lin's photography enthusiast friends, says: "He is always energetic." Zhou also remembers Lin walking around a market for hours to find suitable clothes for the children. In recent years, Lin has been spending a lot of his time on painting, including caricatures, which he regards as an important way to entertain himself and relax. According to Lin, painting, photography, calligraphy and writing are just different means of expression. "So, the most important thing is to choose the right form to express the right feelings," he says. As a fan of traditional culture, Lin says he endeavors to present Chinese culture in his works, and provide a way for young people to get in touch with traditions. According to his friend Guan Jianren, a researcher at Sun Yat-sen University, people like Lin's works because they connect traditional Chinese culture with modern life and awaken the "cultural genes" in the younger generation. "They (the younger generation) find resonance in his works," says Guan. Lin's caricatures, which feature traditional styles and materials, often reflect his observations of modern society. For example, some mock people's addiction to electronic devices. "I hope that my caricatures can have a positive effect and make people optimistic," Lin says. And he adds that he always tries to look at the world with sympathy and a soft heart. Asked how he deals with his celebrity status, Lin, who is now well known as a painter, photographer, calligrapher, columnist and author, says that becoming famous has not affected his daily life, and that he manages to strike a good balance between his work and his hobbies. Meanwhile, Lin updates his official account on WeChat, a popular social media platform, almost every day, posting pictures, new paintings or articles for more than 900,000 followers. And he says he values his bond with his fans, whom he treats as friends. As for his opinion of social media and the impact it has on his work, he says: "In the internet age, sharing works helps you get quick feedback. So it pushes artists to constantly adjust and innovate." Lin believes that artworks are not only about self-expression, but should be meant for resonance. "When I create, I care about viewers' feelings, and try to make my work graceful, light and happy, a little candy for viewers," he says.